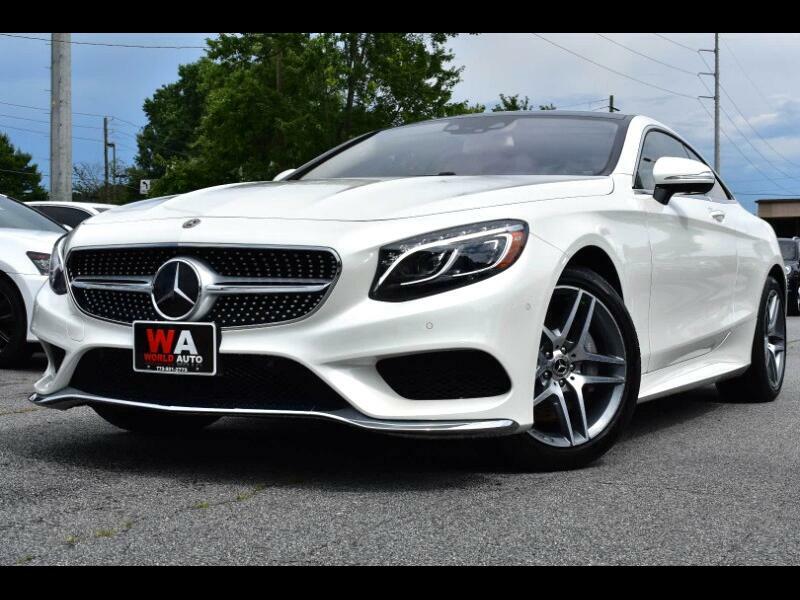 ---FULLY INSPECTED BY LOCAL MERCEDES BENZ DEALER--- 2017 MERCEDES BENZ S500 4MATIC COUPE, DESIGNO DIAMOND WHITE METALLIC ON PORCELAIN/ESPRESSO BROWN, 9 SPEED AUTOMATIC TRANSMISSION, PREMIUM PACKAGE, DRIVER ASSISTANCE PACKAGE, WARMTH & COMFORT PACKAGE, BURL WALNUT WOOD TRIMPORCELAIN HEADLINER, GLASS PANORAMA 1ST AND 2ND ROW SUNROOF WITH POWER SUNSHADES, NAVIGATION SYSTEM, BLUETOOTH WIRELESS TECHNOLOGY, HEAD UP DISPLAY, ACTIVE MULTI CONTOUR SEATS WITH MASSAGE, SURROUND VIEW SYSTEM, FRONT VARIABLE HEATED SEATS, SPEED LIMIT ASSIST, PRE SAFE BRAKE, DISTRONIC PLUS, BAS PLUS WITH CROSS TRAFFIC ASSIST, COLLISION PREVENTION ASSIST, STEERING WHEEL ASSIST, ACTIVE LANE KEEPING ASSIST, ACTIVE BLIND SPOT ASSIST, COOLING FRONT SEATS, HEATED STEERING WHEEL, HEATED FRONT DOOR PANELS AND CENTER CONCOLE, WOOD/LEATHER STEERING WHEEL, HEATED REAR SEATS, DUAL POWER SEATS, MEMORY SEATS, PUSH BUTTON START, KEYLESS GO, WOODGRAIN PACKAGE, LED HEADLIGHTS, SATELLITE RADIO, AUXILIARY INPUT, ALL POWER OPTIONS, LIKE NEW IN AND OUT, LOOKS VERY SHARP AND RUNS GREAT, UNDER FULL FACTORY BUMPER TO BUMPER WARRANTY, PLEASE CONTACT WORLD AUTO FOR MORE INFORMATION AT 770-921-2775. Prices subject to change without notice and do not include Title, License, Registration Fees, State or Local Taxes or Processing fees, if any. Please contact seller first for vehicle availability. Although every effort is made to present accurate and reliable information, use of this information is voluntary, and should only be deemed reliable after an independent review of its accuracy, completeness, and timeliness. It is the sole responsibility of the customer to verify the existence of options, accessories and the vehicle condition before time of sale. Any and all differences must be addressed prior to time of sale. No Expressed or implied warranties, including the availability or condition of the equipment listed in made. EPA mileage may vary depending on driving conditions, driving habits, and vehicle maintenance. Our dealership is not responsible for void factory warranties. Dealer is not responsible for any option listed in the ad. Please verify the options at the time of purchase. Ads are placed by decoding the vin numbers and some option may get automatically selected. No intention of misleading the customer. Message: Thought you might be interested in this 2017 Mercedes-Benz S-Class.